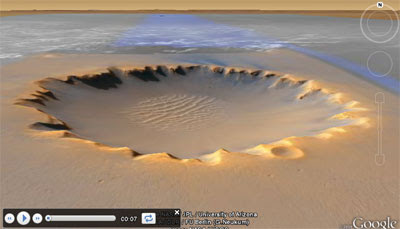 I really like the latest update to the Google Earth plugin, especially its ability to play narrated tours. As an example of the new narrated tour feature and the new Mars feature I have created this tour of the Victoria Crater on Mars using a podcast from NASA for the narration. To view the tour you will need to have downloaded the Google Earth plugin. I think the tour demonstrates the educational potential of the latest version of the Google Earth plugin. I think it looks pretty stunning as well. 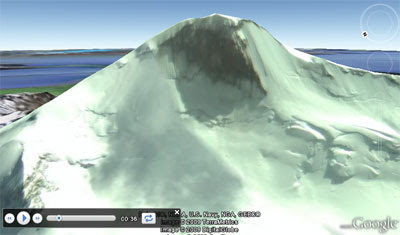 To demonstrate how the Google Earth plugin can also be used to illustrate the news I created this narrated tour of Mount Redoubt. The narration is from a press briefing by Secretary of the Interior Ken Salazar. The briefing was held after the eruption of Mount Redoubt on Sunday March 22.